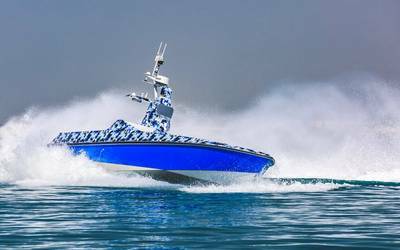 Abu Dhabi based Al Seer Marine has signed a cooperation agreement with Iceland-based company Rafnar to convert Rafnar’s Embla RHIB platform into an unmanned surface vessel (USV). Rafnar began as a research and development company for the ÖK Hull, a hull platform that ensures endurance, comfort and safety for mariners in the harshest of environments by reducing wave slamming impacts. The company new sells its own vessels and provides licensing opportunities for its ÖK Hull technology to vessel builders. After having developed their individual proprietary technologies, Rafnar and Al Seer Marine say they see multiple opportunities in working together. The companies signed the cooperation agreement at the Al Seer Marine Headquarters in Abu Dhabi. The partners are looking to convert Rafnar’s Embla RHIB platform into a manned and unmanned surface vessel (USV) in turn making it one of the most stable USV platforms of its size in the world. Embla earned its reputation in the industry when it crossed the North Atlantic from Iceland to Gothenburg unsupported, tackling up to 6-meter waves over a 1,357 nautical mile distance. While the partnership focuses primarily on offering future USV platforms with the Rafnar ÖK Hull technology, the companies also agreed to a cooperation for the production of Rafnar vessels, with Al Seer Marine agreeing to subcontract builds for Rafnar in Abu Dhabi under the Al Seer Marine license.